Symbols*: The movement of the water represents active psychic energy. The ebbing tides upon the sandy shore contrast sharply with the crashing waves and mirror the expressive side of our inner being. The swimming dolphing merges with the goddess and the waters. Its ability to communicate through echolocation (reverberations emanating from its melon or forehead) brings it in perfect balance with its environment. Dolphins are considered psychopomps and are thought to possess great intelligence and intuitive powers. The fish are symbols of renewal and the crab is a symbol of regeneration. It has the keen ability to locate water. The spirals represent the omnipresent flow of energy. The three seashells on the goddess’s belt are beautifully formed and represent the natural treasures born from the power of the ocean. The conch shell is multitudinous with its seemingly endless spirals. The goddess wears a head- and armband, symbols of eternity and the oneness with all the creatures of the ocean. There is a triskelion design on her face, signifying the continuous nature of birth, death, and rebirth. The delicate ecological balance achieved by the food chains of the oceanic worlds exemplifies this. Description*: Mama Cocha is the Incan goddess of the ocean. Revered by fishermen, she provided bountiful food from her watery realm. She is one of the oldest divinities of ancient Peruvian cultures. 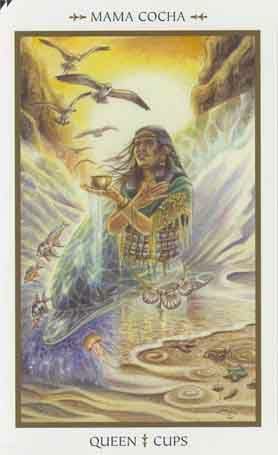 She was the giver of water and rain and provided nourishment and good health to all those that worshiped her. Mama Cocha was the sister/wife of Viracochas. Her name translates to “mother of the sea.” Her influence was primarily situated in coastal areas, where her provisions were vital to the survival of the fishing communities. Possible Meaning: Mama Cocha’s harmonious role as presider of the oceans serves to show us that we, too, can become more connected with our own inner psychic life. The waters of the unconscious are teeming with life and insights into past, present, and future. By learning how to connect with this inner life, we can learn to become more in tune with our own intuitive energy. We can develop the ability to become more empathetic and connected to those around us. This is a time to nurture the intuitive function and to become more sensitive and aware of our environment. Thoughts/Points to Ponder: This queen is creative, compassionate and caring. She has learned to control her emotions, and rests in a loving peace. She is in control of things around her; each element is at present here. Sun = fire, birds = air, fish = water, rocks/mountains = earth. Dolphin is her companion. The dolphin represents creativity, being able to express oneself from a very loving place. This is a very compassionate, comforting, affectionate, emotional yet a very harmonious place to be. I’m in love with this place, never wanting to leave. She offers her cup to me, she is so kind and loving. I think I have found my place to be.